Last year I went looking for a "replacement" dog for a Red/Black/Tan/Buff German Shepherd Dog I had found in Lytle Creek in 1999. Lytle was the true love of my life, and it took me a year after his passing to even think about getting another dog. I knew exactly what I wanted: a multicolored, tan faced, very large, confident male German Shepherd. I needed a dog I could trust implicitly to go hiking with, so, well socialized. I went to a local shepherd rescue event in Encinitas, CA where they had about 25 adult dogs on display. I ignored the furry faces and went straight to the volunteer to ask about temperaments and to give my specifications. They didn't seem to have a dog that fit me, but as I was leaving a foster mom asked me to please take a walk with her and her charge - a small, skittish, white male, sitting quietly in a corner kennel. As we walked she told me that he was really sweet, would make a great pet, and therefore she would push to get him a good owner before the end of the event. I took him on a two week trial basis, thinking I was insane because he was the opposite of what I said I was looking for! He was all bones, and had severe bronchitis for the first three weeks...so I asked that they give me more time to think about it while I nurtured him back to health. At first the dog was extremely shy and seemed to hate men in particular...in fact, he bit my dad in the rear during a holiday commotion! I didn't give up, and I didn't name him until I was sure I would keep him, however soon I claimed a gorgeous white shepherd, dusted with caramel and sporting freckles on his ears. so many great mtn. names, so I settled on Summit. After months of training and socializing Summit has become a GREAT dog, and will even walk up to total strangers! He is a superb nanny for small kids (whether he knows them or not), I leave the front door wide open and he never walks out without 'asking', and he hikes with me everywhere. I am so grateful for a wise foster mom who pushed a scared, sick dog on me a year ago! White, brown, black or purple, shepherds are great companions and as loyal as they come. What a great story. Thanks so much for taking a chance on this sweet white GSD even though he wasn't what you thought you wanted. Just goes to show that what we think we want and want we need are often two different things and what we need is so much more special than that thing that we thought we wanted. Obviously your patience paid off and that is the great part of this story. 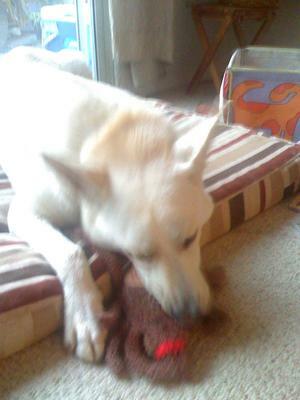 Not only did you help a sick GSD back to health but you helped him right into his forever home too. No doubt those beautiful brown eyes had anything to do with it either! And freckles - I loved hearing about that! 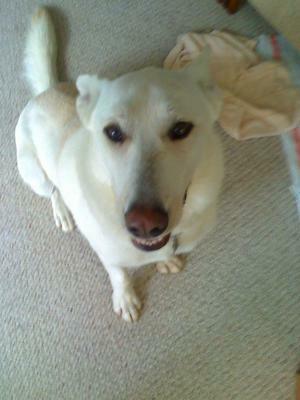 My first German Shepherd way back when was a white German Shepherd named Casian and I have always loved them. To me, color is secondary. If the dog loves you, has a good temperament and fits well into your life what more can you ask - you can't see color in the dark can you? And what does it really matter anyway? Absolutely nothing. 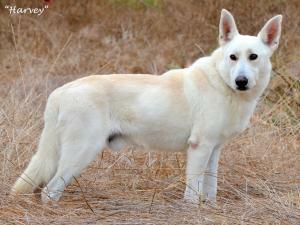 So best of luck to you and your beautiful white German Shepherd, Summit. He is definitely a keeper and I wish you both many years of companionship in the future! Be sure and give him a hug for me! I work with Weeping Willow German Shepherd Sanctuary in Ohio and I see mainly the older GSD and your heart breaks, but on occasion we get a younger one. Your story touched my heart and I had to say "thanks for taking a chance" so many dogs that have the potential of being a wonderful companion get over-looked because they don't act like themselves in a stressful situation. I am so happy this foster mom took you aside and you took the chance. I love the name Summit and I am so happy he worked out so well, I am sure in part because he has such a caring and understanding mom. Thank You! I know exactly how you felt and now feel. Your story is so close to mine. A few years ago I lost my first love, a large, black and tan, male Shepherd. When it was time to stop grieving i went searching for another just like him. I searched for a long time. Then one day I was introduced to a very fearful, sickly white GSD, female. And I can't believe just how much I love her. She wasn't what I wanted, but can't believe my good fortune for having found her. Someone once said you don't always get the dog you want, you get the dog you need. Have a great life with your boy. He's beautiful. No good dog could ever be a bad colour. My seventh GSD was a formerly abused, rail thin and scared white GSD whom the shelter named "Gabe." Two and a half years later, he is neither skinny nor scared and has integrated well with my pack of 2 black and tan GSDs. He, too, smiles! We all adore him. What handsome male, big and strong! You have patience to help Summit to come out of his shell, thank goodness for you. You give him Love and nurture him to a Wonderful companion that he is - it was there but you brought it out. German Shepherds are wonderful, they are, Smart, Loyal, Trustworthy and very Protective. Take care of your boy Summit and he will take care of you! A wonderfull story. You deserve a wonderfull dog and thank you for taking him in and giving him a home he deserves. There is no other that keeps giving love and loyalty than a dog. I love what you said about Lytle, your first dog. That is how I felt about Duchess, my first pet ever. She was a true soulmate and I could have lived forever with her. Sadly, she died this summer. But I'm glad to know that someone else feels the same way about their first GSD. I love what you said about Lytle, your first dog. That is how I felt about Duchess, my first pet ever. She was a true soulmate and I could have lived forever with her. Sadly, she died this summer. But I'm glad to know that someone else feels the same way about their first GSD.